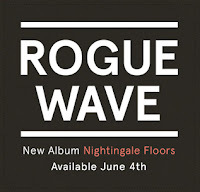 Fake Plastic Tunes: Rogue Wave Annouce New Album, "Nightingale Floors"
Rogue Wave Annouce New Album, "Nightingale Floors"
Nearly three years after the release of 2010's Permalight, Rogue Wave has announced their much anticipated followup album, making it their fifth LP, titled Nightingale Floors. The 10 track LP will be available June 4th (Vagrant), but to tide us over until then the guys have released the first single, "College." Watch: Phosphorescent's Video for "Song For Zula"
Album Review: Phosphorescent - "Muchacho"
Watch: New Video from Phoenix for "Entertainment"
Album Review: Youth Lagoon - "Wondrous Bughouse"